North Cornwall is an Area of Outstanding Natural Beauty and of important geological and scientific interest. The coast of North Cornwall is the only part of the county that is formed of carboniferous sandstone, a type of rock that is around 300 million years old, the rest lies on Devonian Sedimentary Strata and the granite of Bodmin Moor. Famous for its remote, bleak coast line North Cornwall from Bude to a place called Rock close to the Camel Estuary has been protected from development by its sheer inaccessibility. From Padstow to Portreath the North Cornish Coast, exposed to westerly storms and pounding surf, is a landscape carved and sculptured by the sea and the coves and caves portray many tales of smuggling and wrecking. The sea with its gigantic Atlantic rollers has made the Cornish north coast famous for perfect surfing conditions. Other extreme sports such as coasteering, zapcat, scuba diving and rock climbing are also very popular. The North Cornwall’s dramatic Atlantic Heritage Coast has 60 miles of cliffs, coves, sandy bays, market towns, country houses, historic castles, farmsteads and the wilderness of Bodmin Moor. Some of the most visited places to visit in North Cornwall are Bude, Newquay, Wadebridge, Bodmin, Bodmin Moor, Tintagel, Boscastle, Camelford, Padstow, Launcester and Port Isaac all with their own unique history and a variety of things to see and do. Padstow a working fishing port was made famous by celebrity chef Rick Stein, Port Isaac is the where the television series “Doc Martin” is filmed and Tintagel has long been associated with King Arthur and Tintagel Castle being his birth place. 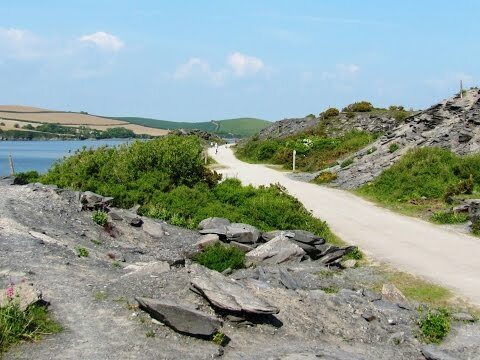 The Camel Trail is another popular activity for walkers and cyclists running for 18 miles it follows the River Camel from the Camel Estuary at Padstow to Wadebridge, Bodmin, Poley’s Bridge and finishing at Wenfordbridge. Wadebridge is a bustling market town in Cornwall straddling the River Camel and was originally called Wade until a bridge was built in the 15th century by the Reverend Thomas Lovibond who had became very concerned about the many deaths of humans and animals whilst crossing the river at low tide. Before the bridge was built there was a chapel either side of the river so the people could pray for a safe crossing then when they arrived at the other side they would give thanks to God. The bridge was built over the dangerous fording point in 1460 and has seventeen arches along its length of 320 feet at first tolls were charged for its maintenance. The bridge, that has been widened twice and refurbished in 1991, was very important during the English Civil War when Oliver Cromwell came here with 500 Dragoons and 1000 horsemen to take it. The second bridge in the town named the Challenge Bridge is a foot bridge over the river connecting Jubilee Fields to the Egloshayle playing fields on the other side and was constructed by Anneka Rice and her team for the TV series “Challenge Anneka”. The Royal Cornwall Agricultural Show is held at the Royal Cornwall Showground, 1½ miles west of Wadebridge, over a three day period in June. Wadebridge Carnival is held annually in July and during the August Bank Holidays the Eglos Craft Fayre and the Cornwall Folk Festival are held. Wadebridge is home to Wadebridge Renewable Energy Network a grass roots enterprise aiming to make the town the first solar powered and renewable energy powered town in the UK and was short listed as one of Britain’s top eco-towns in April 2013. The River Camel rises on Hendraburnick Down on the edge of Bodmin Moor and flows through the Camel Valley for 30 miles before entering the Celtic Sea area of the Atlantic Ocean between Stepper Point and Pentire Point. The river has four main tributaries the River Ruthern, the De Lank River, the River Allen and the River Stannon and together they drain a great deal of North Cornwall. Camel is a Cornish word meaning “the crooked one” named recently after the rivers winding course, the river was originally divided into three named stretches. The River Camel is tidal as far up as Wadebridge and Egloshayle and is excellent for bird watching and fishing. The River Camel’s estuary stretching from Wadebridge to the open sea at Padstow Bay is known as the Camel Estuary and offers a wide range of water sports such as sailing, water skiing, windsurfing, surfing and kite surfing. The estuary between Padstow, Rock and Wadebridge is only a small area of Cornwall’s designated Area of Outstanding Natural Beauty and there are five Sites of Special Scientific Interest along the length of the River Camel. The river has also been designated by the Joint Nature Conservation Committee as a Special Area of Conservation as being of European importance for the Otter and the Bullhead. With the large areas of salt marsh on the estuary the River Camel provides an excellent location for large flocks of waders, Mute Swans, Shelduck, Shoveller and Mallard and further upstream Teal. There are Peregrines in the area and a migrant Osprey is often seen in the spring and autumn stopping off for a few days to feed on the fish. The Camel Estuary was one of the first places to be colonised by Little Egrets mainly seen in the mudflats at low tide. The estuary is also a Sea Bass conservation area and further up river Flounders, Salmon and Sea Trout can be found. Basking Sharks and bottlenose dolphins can sometimes be seen in the mouth of the river. The Camel Trail that follows the River Camel is the old dismantled Bodmin and Wadebridge Railway Line which ran from Wenfordbridge to Padstow. The railway was built intended to carry sand from the Camel Estuary to inland farms for the use as fertiliser and rock and minerals to the sea for shipment. The railway, one of the oldest in the world, was opened in September 1834 with the locomotive Camel pulling a train load of 400 passengers. It was one of the first railways in Britain to carry passengers and the last passenger train left Wadebridge railway station in 1967 following cut backs. In the late 1980’s the railway line’s transformation into the Camel Trail provided a just over 17 mile traffic free route for walkers, cyclists and horse riders. Starting at Padstow the trail is 5¼ miles to Wadebridge then onto Bodmin is a further is 6 miles and then onto Poley’s Bridge is another 6 miles. The trail managed and maintained by Cornwall Council was extended in 2006 from Poley’s Bridge through the old clay dries to Wenfordbridge (this is the only part of the trail that is on roads shared with normal traffic) and from Scarlett’s Well car park at Bodmin up into the town increasing the trail by another mile to just over 18 miles. There are car parks, cycle hire, bike parking and many other facilities at Padstow, Wadebridge and Bodmin so you can pick and choose how you explore this wonderful trail with beautiful scenery and an abundance of wildlife. We park in the car park near Lower Halwyn and walk up the steps onto the Camel Trail and turn right and follow the Camel Trail with the River Camel on our left the tide is out, for 3.5 miles to Wadebridge. As we approach Wadebridge we go under the road bridge and head towards the old 15th century arched bridge. We then turn right into the town centre for a quick look round. We then make our way to the park area, Jubilee Fields, and walk across to Challenge Bridge and the bank of the River Camel. We about turn and make our way back to the Camel Trail. We now retrace our steps following the Camel Trail, the tide now in, back to the car park. This is an easy flat walk on a good level track. Elevation: approx lowest point 2.6m (8.5ft) approx highest point 17m (56ft). Approx 7.75 miles allow 2 hours 40 minutes using OS Explorer map 106, Newquay and Padstow. Cycling from Wadebridge to Padstow allow 2½ hours at a leisurely pace. Start Point: Car park near Lower Halwyn at the side of the Camel Trail 1½ miles from Padstow. Wadebridge is situated on the River Camel in North Cornwall in the South West of England. From the M5 take junction 31 and merge onto the A30 towards Bodmin and Okehampton then take the A395 at a roundabout towards Hallworthy and Camelford. At the t-junction turn left onto the A39 towards Wadebridge. After passing Wadebridge take a left turn onto the A389 at Hal’s Grave. On reaching Trevance take the first right and follow the minor road to a t-junction at Trevilgus Farm on the right. Turn right and then first left and follow the single track road until you reach the car park just below the Camel Trail at Lower Halwyn. There are public toilets in Wadebridge at the start of the Camel Trail and in the town centre. There is also two pay and display car parks. For refreshments in Wadebridge there are ample shops, cafes, tearooms, bakeries, pubs, restaurants and take-away. There are some picnic tables in the car park at Lower Halwyn. Eating Agar pellets is how you must start in the video game to get your self larger.